Quality house on beach, 3 bedrooms, 3 baths, optional 4th queen bed. Directly located on beautiful Playa del Coco beach with amazing ocean views and spectacular sunsets. A serene environment with easy access to the quaint towns of Barra de Navidad and Melaque for surprisingly great restaurant choices and shopping. Enjoy a luxurious 3000 sq ft home in the friendly, gated community of Musica del Mar. Large, furnished covered terraces both in front and back adding another 1200 sq/ft of outdoor living plus a thatched palapa right on the beach where you can sit in comfy chairs to whale watch, read or enjoy a Margherita with friends and family. Top of the line appliances in the fully equipped kitchen with island and breakfast bar. Lovely, tasteful décor throughout. Three large bedrooms; two with king bed and stunning beach/ocean views, third bedroom with two full beds and private patio. Enjoy walks on miles of clean sandy beach, do laps or splash around the 40 foot solar-heated pool. World class golf courses only 1 km away (Grande Bay) and 35 minutes away (El Tamarindo). Go deep sea fishing or explore other nearby beaches. Visit the fish market in the morning when the boats come in and why not pick up fresh bread at the local French bakery just a few steps away. What a great way to start your day! Ulfar is a retired Air Canada Captain. Marie is still working in information technology. We wanted to wake-up and look out onto the ocean every day. We wanted to be part of a community of people who love Mexico and want to experience its unique culture. We fell in love with the area after visiting several other Mexican locations, its quaint towns with just enough tourism to support some really good restaurants and fun shopping. A truly comfortable home built to allow its occupants to take full advantage of the weather and magnificent views. toilet, tub, shower, Two sinks, huge tub, shower and walk-out to private patio. toilet, shower, Onyx sink. Wood cabinets, beautiful tiles. toilet, shower, Onyx sink. Wood cabinet. Large shower with seat. Nearby the quaint villages of Barra de Navidad, Melaque, Cuestacomate and La Manzanilla. Very private. Miles of beach to walk-on. Sea turtles returning to nest. Dolphin and whale watching. Amazing sunsets on the horizon. Individual units in bedrooms. Split AC. Rarely required. 2-4 cars could be parked in driveway. Double garage. One space available for renters. Good quality towels and lots of them. Includes large pool towels purchased from Costco. Weights, bands, ball, yoga mat. 3 seater, 2 seater, one seater. Very comfortable, lots of cushions. Appetizer plates, dinner plates, desert plates, platters, serving bowls. Good quality knives. Beautiful marble table, square. Sits 8 comfortably. Most meals will be taken outdoor another table also can sit 8 comfortably. Sky HD Sat tv in main area and master bedroom. Boose wireless speaker. Netflix available on 58 inch tv, Movie library on hard drive. Bring your own mp3 player. The hook up is ready. Hard drive with extensive movies. Day trips for fishing or sightseeing are available. Facing ocean - 8 Lounge chairs. Table with 6 chairs. 2 rocking chairs. Facing front gardens - table with 4 chairs and extra two chairs and coffee table..
Tennis lessons available at Grand Bay Hotel just down the road. Nearby at Grande Bay or Tamarindo or Manzanillo. Heated, about 40 feet, great for swimming laps. With 'in pool' seating facing sunset. Palapa overlooks pool. Car, driver, cook and extra cleaning on special request and depends on avalability. We rented this beautiful villa with another family. The home is absolutely amazing. There are two bedrooms that open to the patio and ocean that were great for the adults and a third bedroom with two queen beds that was perfect for our two 16 year old daughters. We lived on the patio by the pool. The view is stunning and it is secluded and private. You literally could go all day without seeing another person on the beach. The patio furniture was top notch for laying around the pool all day. I have to say as someone that has rented many homes on VRBO for vacation. This one was the most stocked. The kitchen had all the appliances and utensils needed and then some. In addition, to basic cooking needs like spices and olive oil. The owners encourage renters to buy and leave it so other's can benefit. I think it's a great idea and we did the same. They have satellite tv so we could watch a Chicago Blackhawks playoff game which was pretty amazing and nice surprise. Marie was the best hostess. She actually was in Mexico when we arrived and personally oriented us to her home and where to get groceries etc.. She even located a cook for us- Aida who was AMAZING! She made us tamales, enchiladas, salad, guacamole, and flan and delivered it one night. Best meal we had. One thing to note is that this is fairly remote. You do need to rent a car to get around. It's fairly easy to drive to Colimilla, park, and water taxi to Barra De Navidad which is where most of the food and activity takes place. Also the time of year we visited, the ocean was not really swimmable in front of the house. You could go put your feet in, but waves were big and under tow strong. We ended up going into one of the beaches by Manzanilla for the day to boogie board. It was about a 30 minute drive and not a big deal. We liked the isolation and peacefulness of the stay. Marie checked in with us via email several times to ensure things were going well and was a great host. I would highly recommend this rental! Truly a 5 star plus!! We have stayed at this supurb private home on two occasions and plan on returning again. Owners are super accomodating. 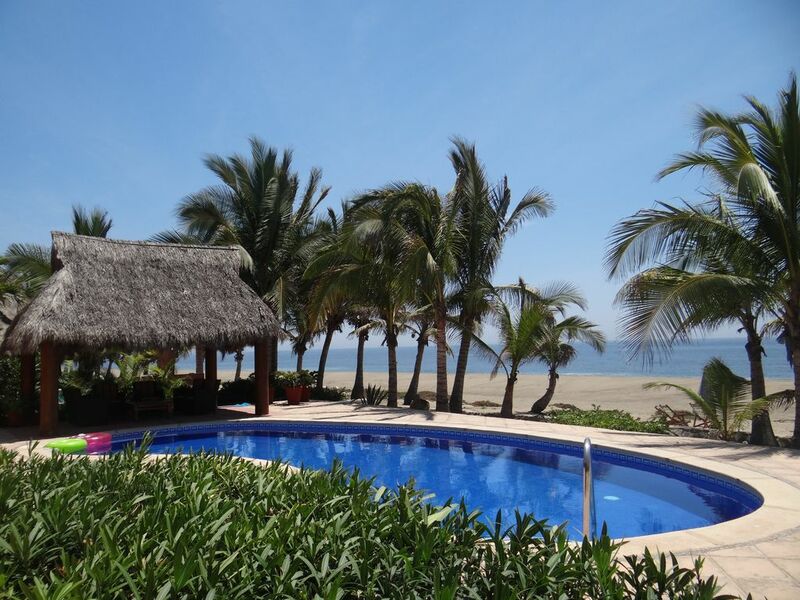 Location is excellent, close to Manzanillo. Secure gated community, yet close to small towns with all necessary ammenities, golf couse, restaurants etc. Surrounding community is tourist friendly and safe for non residents. The home itself is extremely well equipped, immaculate, spacious and can easily handle 3 couples. Pool & Hot Tub overlook the ocean and evening sunsets are a must see! Truly enjoyed morning beach walks as this beach was never crowded. We were lucky enough to meet some of the neighbors who were very friendly and added to the vacation experience. HIGHLY RECOMMENDED! Located on a beautiful sandy beach, environmentally protected as nesting grounds for sea turtles. Great golfing nearby. Charming villages to visits with lots of shops and restaurants. This is the Mexico that everyone should experience.